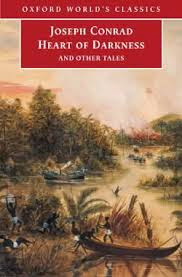 This month we will be reading Heart of Darkness by Joseph Conrad. Heather from Do Not Let This Universe Forget You chose this book for us and will be leading the discussion. Below are her opening remarks, explaining why she chose this particular book. I chose Heart of Darkness because it has come to my attention that I need to reread it. I read it in High School as just one of those books you read because you are in High School and I feel like many a book is read for that reason and the reader is not quite ready for it. Anyway, it is now my brother’s favorite book and my little sister, who is turning into quite the intelligent reader was pretty wowed by it too. She says it reads like a really amazing extended poem. That really made me want to read it again (although that will probably cause some people to groan a little bit). So, I picked it this year to give it another chance, and because if no one likes it we can all blame my siblings and not me. If you plan on reading along with us, we've love to hear from you in the comment section below. You do not have to read this book to be part of "the club." We are all of us busy wives and mothers and want you to feel free to read with us whenever time permits and/or a title interests you. We love it when you write up a blog post of our own detailing more of your thoughts on the books you've read. At the conclusion of the month we will invite you to return and share your thoughts with us. I actually was partially attracted to this book because it was short. Short book for a short month.